Gardeners who include plants for bees, butterflies, hummingbirds and other pollinators not only offer important habitat for these species, they often enjoy a greater fruit and vegetable bounty come harvest-time. Bees, in particular, are master pollinators of many of our fruits and vegetables. In fact, we rely on pollinators for one-third of our food supply, but pollinators are facing many challenges including habitat loss, disease, and harmful pesticides. Planting native plants is one of the best ways to help pollinators and create a sustainable landscape right where you live. Planting them can also increase your food plant yields. Native plants are those that naturally grow in your region. They’re important because they’ve co-evolved and have an interdependence with local wildlife, especially pollinators. If you grow your own fruits and vegetables, including native plants can help ensure a bountiful harvest because natives will attract more pollinators to your food plants. The following are a few tips you can follow to help your garden crops thrive and support local wildlife pollinators at the same time. Squash bee species are native to North America and have co-evolved to feeds exclusively on plants that are members of the cucurbit family (summer squash, winter squash, pumpkins, melons, cucumbers). These bees are called specialist bees as they are shaped to engage effectively with the structure of the squash flower. They are extremely efficient pollinators of these plants, starting early in the morning and moving rapidly between many flowers, never leaving to “check out” other plant species. Don’t be alarmed if these solitary bees make their nests in nearby soil patches. They are interested in only one the plants and will not bother people unless attacked. Tip: Plant a selection of squash, cucumbers, pumpkins and melons that support squash bees and provide a diverse selection of late summer foods. Leave some bare soil under these plants and as squash bees are known to nest under the leaves of these plants. Beautiful edible flowers and herbs are a great way to supplement your selection of native plants to provide extra sources of nectar for pollinators. Consider adding some of these common beauties to your garden–and your salad! Nasturtiums – There are many varieties these bright yellow or deep orange-red garden flowers. Both the flower and leaves have a mild peppery taste. Sunny sites help these brilliant blooms thrive into early fall. Bonus: Nasturtiums actually attract aphids, keeping these tiny pests from doing damage to your other plants. Ladybugs are very beneficial insects will visit to eat the aphids! The common persimmon (Diospyros virginiana L.) is a native to much of the eastern half of the U.S. It’s also a fruit producing tree that has bright orange oval fruit that is full of carbohydrates, iron, potassium, sugar and Vitamin C. People enjoy the sweet fig-like taste off the fruit which can be eaten directly or used in jams and other treats. 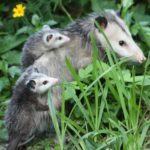 Opossums, raccoons, skunks, deer, and birds also feed upon the fruit. Both wild native bees and domesticated honey bees use persimmon as a nectar source and pollinate it resulting in the formation of the fruits. Tip: Native flowers, along with ornamental annuals like zinnias, cosmos, and some herbs that bloom into fall can provide a late-season nectar for pollinators, acting as a great companion planting to your fruit and vegetable crops. Increase your crop of berries to share with birds and other wildlife by attracting pollinators. Studies have shown that when native wildflowers are planted around high-bush blueberry fields to attract native pollinators, the wild native bee population doubled within two years and blueberry yields increase up to 20 percent (University of Michigan 2016). Native bees, including bumble bees, are the most effective pollinators of blueberries. One of the most important things you can do in your garden to help pollinators and other wildlife is to eliminate, or at a minimum significantly reduce, the use of chemical fertilizers, insecticides, herbicides and other pesticides. Going chemical-free ensures that your garden is a healthy, safe place for wildlife as well as your pets and family. Use the National Wildlife Federation’s Native Plant Finder to get a list of the plants native to your zip code that support pollinators and other wildlife. Once you incorporate the tips above in creating a pollinator-friendly food garden, you will provide food, cover and places for wildlife to raise their young. Add a water source like a birdbath or butterfly puddling dish and your garden can qualify to become a Certified Wildlife Habitat with The National Wildlife Federation, and be counted in the Million Pollinator Garden Challenge. Anyone, at any age, anywhere can participate with almost immediate results – potentially doubling the numbers of diverse local wildlife.